I’m not sure where I heard of this book, but I grabbed up the audio version months ago with the intention of saving it for RIP season. By the time I tentatively hit “play” on September 1st, I was pretty sure this book and I were not going to get along. I worried that it would be too surface-level for me, when I’ve been wanting thicker fantasy this season. However, I was hooked right away, and found myself racing through the book and (again) desperately wishing the sequel was out already. The elements in this book aren’t exactly brand new. This is not a criticism – let me make that clear right away. In fact, I marvel at how the author turned so many commonly used fictional elements (scavenger hunt, teenage orphan, magical races at war, a legend most people don’t believe in, misfits, prejudice based on looks/race, living in a library, etc) into something so unique and beautiful. I loved the writing, the characters, the various ways in which love manifests itself, the friendships (longstanding and unlikely), the fact that killing isn’t glorified (and is actively un-glorified), and so much more. I found myself thinking quite often of Laini Taylor’s Daughter of Smoke and Bones series, which is one of my all time favorite YA fantasy series. 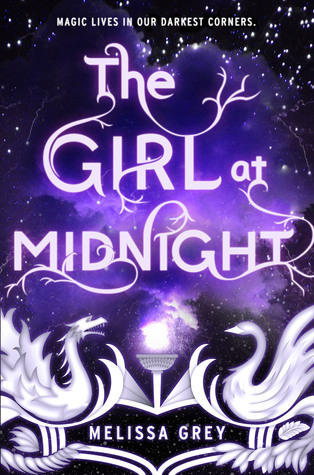 Many of the elements are the same – human raised by a magical race in a war with another race, star-crossed love, a secret behind the human’s existence, a band of unlikely allies…etc. After I finished this book, in fact, I saw that 1) Daughter of Smoke and Bone is referred to in the GoodReads description, and 2) a lot of people criticize the book for being too similar to it, as if this is just a recycled, inferior version. I’ll say flat-out that I disagree with these criticisms, though I agree the comparison is apt. Yes, the two books are similar, but are unique enough that they can both be good without trying to out-rank each other. Both deserve to be read. That’s all I’m going to say about that. This was my third RIP books so far, and man I’m having a good RIP season! This one is fantastic. Highly recommended, especially on audio! Performance: The audiobook was narrated by Julia Whalen. It was my first experience with Whalen, and she did a wonderful job. I loved all the voices she chose, each of them fitting the characters’ personalities perfectly. I hope she does the sequel, too, because I will definitely be getting that one on audio! This entry was posted in 2015, 2017, Prose, Young Adult and tagged atmospheric, audio, LGBTQIA, reread, RIP-worthy, speculative. Bookmark the permalink. I love the idea of an audiobook for RIP. Somehow I never thought to do that, although I wonder if it’s creepier to hear a story or to read it on paper…. Ooh, there are some really, really fantastic RIP audios! A few years ago, I listened to The Screaming Staircase by Jonathan Stroud, and had chills the whole time. Sadly, the next book wasn’t available in audio, so I read it, and while it was good, I didn’t get that chill-effect. I think sometimes hearing something can be much more chill-inducing!